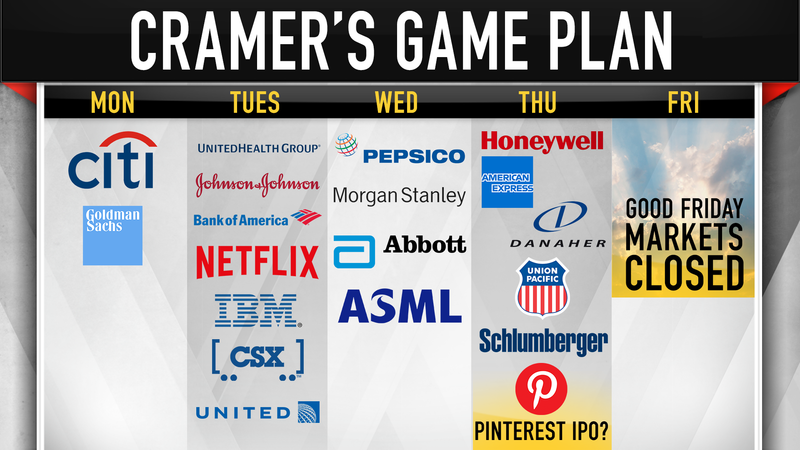 "Even though earnings season kicked off with an amazingly bullish bang, we'll be right back where we started from once next week rolls around," CNBC's Jim Cramer says. "In the cacophony of earnings reports next week, remember that this market has no memory," the "Mad Money" host says. "Today was terrific, but come Monday we're at the mercy of the next news cycle," he says. The major U.S. indexes all rallied Friday on the backs of Walt Disney, J. P. Morgan Chase, and Chevron, but CNBC's Jim Cramer warned that "this positivity" will be hard to sustain. "I doubt Citi will be as bad, but the stock's run up too much at this point, so don't get too excited here. People want revenue growth, not endless buybacks," he said. Goldman Sachs: Goldman Sachs is out with its results in the morning as well. Cramer noted that the company is being investigated for its role in the 1Malaysia Development Berhad scandal. The conclusion will hinge on how well the bank's compliance team handles the matter, he said. "CEO David Solomon is starting to make his mark, and I like his mark," he said. "If the stock pulls back, I'd be a buyer." "Money managers have collectively given up on the health insurance space because so many candidates running for president are campaigning on some form of single-payer [health care]," the host said. "I actually like the stock, though, and I'm ready to tell you the coast is clear after we hear what the company has to say." "I think they're gonna have a great story to tell. Unfortunately, there's still some overhang from that talc issue, and I'd rather find out that the big verdict against them in Missouri has been overturned than hear about a big upside surprise," Cramer said. "Oh, I bet it'll be good, but not necessarily good enough to push the stock higher, I mean given that the darned thing already rallied nearly 4% today in anticipation of a good quarter," he said. "I think business will be strong and they'll talk about how they welcome the new competition from Disney and Apple," Cramer said. "Of course, the stock got slammed today, but I'm skeptical of a big gain here if only because so many people wrongly do believe the streaming business is zero-sum. If Netflix pulls back on a solid quarter, I'd rather be a buyer." "CSX is doing precision railroading, running everything as efficiently as possible," Cramer said. "United Continental has an edge over the other airlines because the fleet doesn't have as much exposure to Boeing's grounded 737 Max." "Sometime in the second half of the year, we don't know, the merger with Cramer-fave Red Hat will close, and I bet that gets people more juiced about the stock," he said. There's a chance the company raises its long-term forecast, he said. "I'm anticipating an awesome quarter from these guys, lots of good stuff about their diabetes monitoring sales. Just an incredibly consistent company," Cramer said. ASML Holding: The chipmaker also reports earnings in the morning. Cramer noted that the stock spiked in Friday's session, which could portend good news. "If ASML can deliver, you'll see the whole semiconductor cohort pop. I wouldn't buy this one, though — just listen. I prefer Lam Research if you want a semiconductor machinery play," he said. "I expect CEO Darius Adamcyk to give us some terrific numbers," he said. "AmEx has a tendency to sell off after it reports. My advice: wait until you see the whites of the sellers' eyes, and then pull the trigger," Cramer said. "I wanna see how Danaher's gonna integrate it. If you hear that 2019 is going to be an investment year because of that acquisition, the stock is gonna get hit and then you pounce," he said. "They now need to worry about crops being weak because of all the storms and fracking — sand falling through the floor because they have so much of it now in the Permian area. I wouldn't get in front of this speeding train," Cramer said. "I think the stock is cheap, [my] charitable trust owns it, [but] nobody cares," he said. Disclosure: Cramer's charitable trust owns shares of Honeywell, Danaher, Disney, Citigroup, Goldman Sachs, J.P. Morgan Chase, UnitedHealth, Schlumberger and Lam Research.